In the perfect world, every room of your home should have at least one walk-in closet, however, the reality is totally different. Usually, we do the best with the ones we have, and very often most of us fail in organising our stuff. Well this is one of the reasons why so many people are going crazy about the fancy and appealing hanger racks. They are an affordable and convenient storage solution that can save a lot of space while being able to store a great number of your clothes. According to interior designers, clothes hanger rack is a real life saviour for those of you who have a limited or no storage space at all. The best thing is that a clothes hanger rack like this will give you an easy access to all of your clothes, and you will be able to move it whenever you want. Last but not least, this type of hanging storage is airier which means that your clothes will not have that strange smell when stored in the closet for a longer period of time. However, just like storing your clothes in a closet can get messy, storing them in hanging racks can get pretty messy as well. In order to avoid this, there are few steps you need to undertake to have uncluttered and neatly organized hanging rack and the first one is to store only your favourite pieces of clothing. In case you want to place more than one hanger rack, make sure you choose ones that match. Another great strategy for having your clothes neatly organized is by having them lined up by colour. That way they will look much more uncluttered while giving your room a breath of life as there is nothing more appealing and breathtaking than a well-organized stylish room. In case you are not a fan of black racks, interior designers recommend choosing ones that will match the colours of your walls. In order to get the most out of your free space (and if possible of course), you can create a built-in closet around the hanger racks. That way, your clothes will still be exposed but you will have much more space for storing some other things like your shoes and bags. 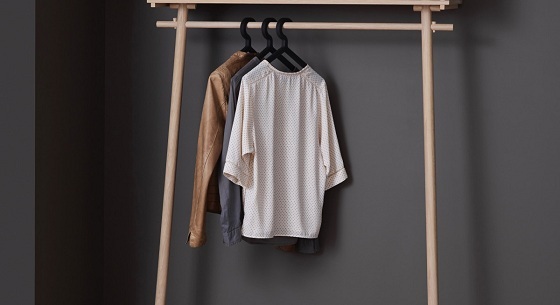 Whether wooden or made out of some kind of metal, hanger racks are an ideal solution for those of you who do not have that much of a free space.